People, especially the younger amongst us, often confuse Memorial Day and Veterans Day. In the most simple of terms Memorial Day is a day to remember those who made the ultimate sacrifice, giving their lives for our country. Veterans Day is a day we say thanks to those who have risked everything to serve and protect us. Veterans Day started as Armistice Day to commemorate the day World War I ended. The cessation of hostilities of World War I officially began on the 11th hour of the 11th day of the 11th month. After World War II President Eisenhower designated the holiday Veterans Day, as a day of recognition of all members of all branches of the service that have served the nation. While millions of veterans walk the streets beside us every day, we don’t recognize them. They look like us, they talk like us; they are us. What we often fail to realize is even though we cannot readily identify the many veterans who blend into society, many have permanent scars from lost limbs and emotional trauma to personal lives devastated by the stresses of being separated from their loved ones. Deployed veterans, of both sexes, get divorced at twice the rate of the general public. Spouses of veterans often say that their partners return from war different; what they’ve faced changes them all, some more than others. While these veterans may have survived their ordeals, many left behind more than just body parts. Every year on the 11th of November we pause to thank those that have served our country. Without their service our nation could not endure. All over the country on this day Veterans Day events pay homage to the brave men and woman who insure the rights being abused by the Occupy demonstrators. Public officials have a special duty to respect those who risked their lives to allow them to hold office, such as the mayor of Richmond, California. 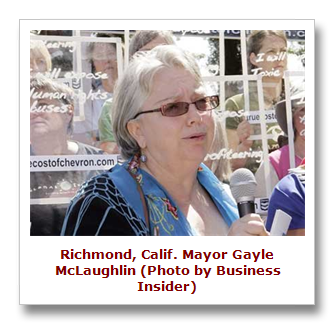 Unfortunately Richmond Mayor Gayle McLaughlin isn’t very grateful. Richmond was holding a Veterans Day event including a re-enactment of the launch of a World War II-era ship at the Richmond shipyards. Mayor Gayle McLaughlin notified the San Jose Mercury News that she would not be attending a Veterans Day salute choosing instead to attend an Occupy event. 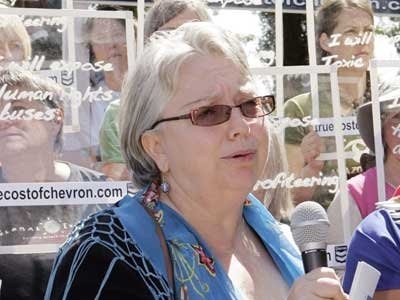 The mayor’s choice to attend an Occupy rally, that she herself had been actively promoting, and not honor those that allow her to hold office, is just one more demonstration of the narrow-minded simplistic views of McLaughlin and her left-wing brethren. Was our involvement in World War II needless, or should we have stood by while our European friends were slaughtered? Should we have just dusted off our shoulders after the Japanese attacked Pearl Harbor? Sorry Richmond, you elected her. McLaughlin has a history with the Richmond Progressive Alliance, a radical left-wing group that has promoted socialistic ideals and hatred of America. How does someone like this get into office in the first place? McLaughlin is an embarrassment to the people of Richmond. Choosing to cozy up with the Occupy anarchists while disrespecting millions of veterans is disgusting. Perhaps this is what Richmond, California wants for its city; then everyone quit your jobs, head downtown, smash a few bank windows and smoke a little pot. How pathetic is this?